The Church of Saint Félix is built against the ramparts of the ancient fortifications at the foot of the castle. It was built in the middle of the thirteenth century (1253), incorporated into the southern wall of the castle which could be reached through an underground passageway, whose entrance, although closed, can still be seen today. The church served as an arms store. From 1371 the village spread out below the rampart and the armoury was transformed into the parish church with a barrel vaulted ceiling. The other churches became rural chapels (Roca Vella, Sant Sebastia et Tanya). 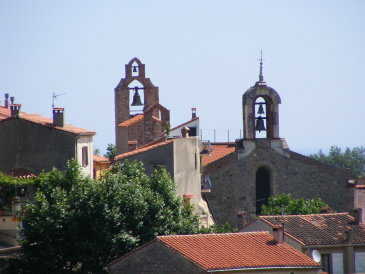 The parish church has two bell towers. The bell which overlooks the place de la République (in the background of the photo) rings the time; the other one rings for ceremonies. The bells date from the fifteenth-century In 1870 they were melted down to be turned into cannons. The bells today are much more recent. You can see some bricks in the Eastern wall which were added later to block up a door which led directly into the vestry. The building of the church owes its origin to the followers of Saint Felix who was the first patron of Laroque. He was a Spanish saint and martyr from Gérona. It is said that he was tied by the neck to a millstone and drowned at Gérona round about the year 304. It was restored in 2012. 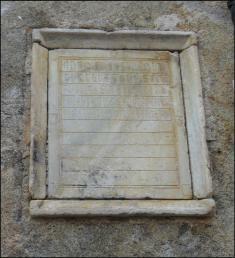 In the wall, next to the door, there is an ossuary containing the bones of several people who had lived in Laroque. As people’s bones were added, their names were engraved in the list. The altarpiece is carved in gilded and coloured wood and dates from 1723 (inscriptions are shown on the blue knobs either side of the altar). It is probably the last one carved by the sculptor, SUNYER. This masterpiece is signed by the PERARNAU family. In the centre there is Saint Félix with the mill wheel, symbolising his martyrdom. Above, Saint Félix is Saint Blaise (7) with the mitre and the cross. · On each side are bas-reliefs painted in gold, representing scenes of the martyrdom of the two saints. - On the left (1) : the martyrdom and the glory of Saint-Félix, venerated for his faith, deacon of Saint-Narcisse and bishop of Gérone. - On the right (2) : the martyrdom of Saint-Blaise (in 316) and his glory in heaven. Through popular fervour, he became one of the fourteen Auxiliary Saints. He was also the second patron of Céret, after Saint Peter. The Chapel of the Christ dates from the thirteenth century and at the present time it is being restored. In the painting at the back of the Chapel, you can see the Tower of Laroque on the right with the Holy City of Jerusalem on the left. This painting was painted in 1526 by Anton Della Rocca. On the 7th of October 1571, there was a naval battle in the Gulf of Patras on the West coast of Greece between the fleets of The Holy League and the Ottoman Empire. This picture represents the scene in which Pie V consigns the Holy League flag to Don Juan before his departure. 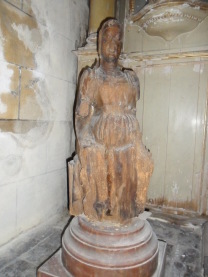 The Virgin Mary with child carved in wood from the fourteenth century. The pregnant Virgin is a figure of Christian iconography depicting the Virgin Mary, pregnant with Jesus designated also as parturient Virgin. This representation of Mary in pregnancy exists from the thirteenth century but decrees would have restricted expressions from 1563, after the Council of Trent . This statue was found amongst a pile of logs in the fireplace of a local farmer. It was cleaned and treated with a stabiliser and represents one of the few statues of the pregnant Virgin.